Summer is coming, time to show your legs in this 50s Mira Swing Shorts! For those of you who have not been formally introduced to swing shorts, we’d like you to meet Mira; she'll become your favourite summer wardrobe staple! This flowy style features short wide legs that will dance with every step you take, making her flattering for both ladies with slim legs and ladies with curvy legs ;-) Handy side pockets with faux buttons embellish the front for a playful touch. 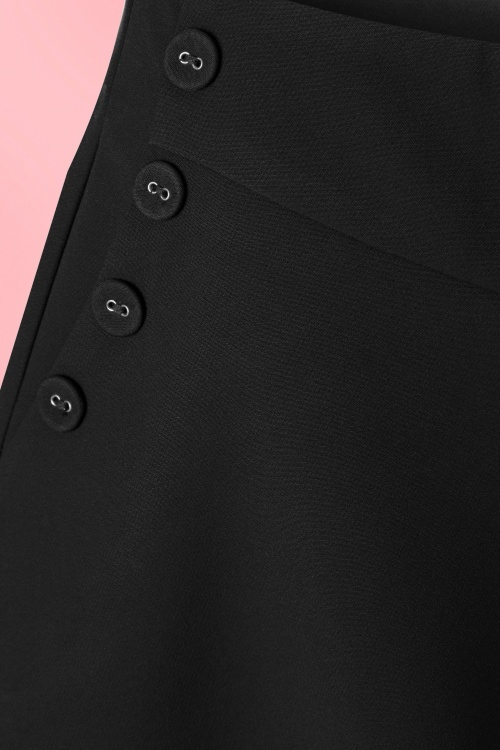 Made from a smooth and supple, black fabric with a very light stretch that's just perfect for the upcoming season. Does this introduction lead to a new get-together? Super tolle Hose! Lovely Shorts! Ich trage diese Hose liebend gerne. Der Stoff fällt sehr schön und weit. Von weiterem sieht es sehr wie ein Rock aus und aus näherer Betrachtung ist es eine sehr elegante Hose! I really love to wear it.